The croque-en-bouche (croquembouche) is a traditional French dessert which consists of a conical tower of cream puffs. The puffs are filled with pastry cream and attached with cooked sugar. It’s common to see the croquembouche served at weddings, birthdays and other special occasions in France. So of course, we made one at FERRANDI. 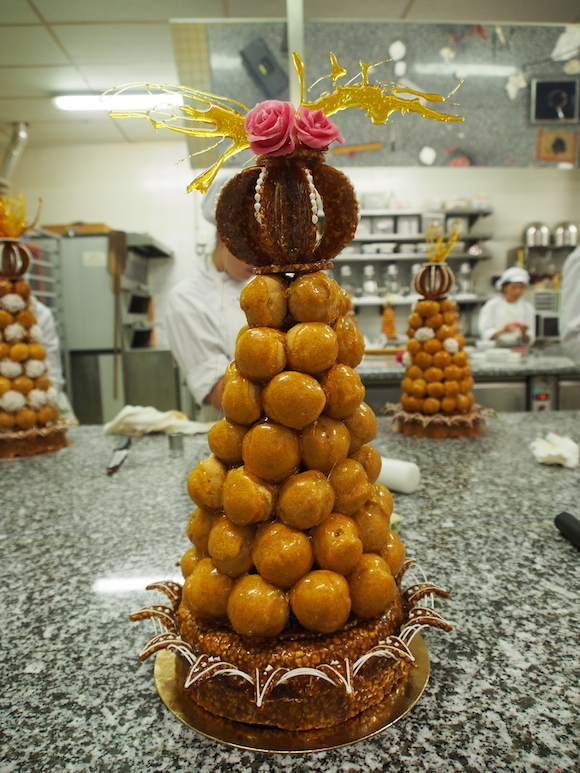 In order to make the croquembouche, we first needed to create a base for our piece. 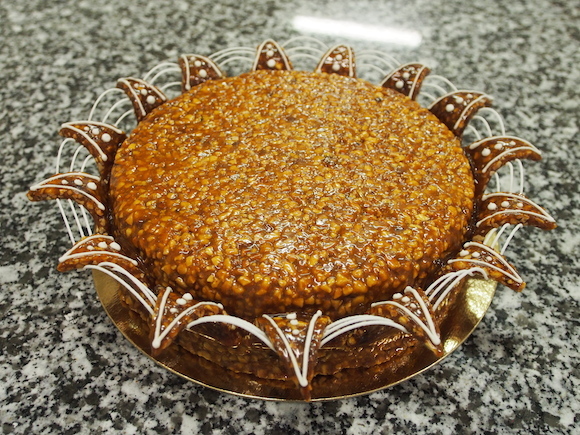 The base was made of nougatine, a mixture of nuts and sugar. 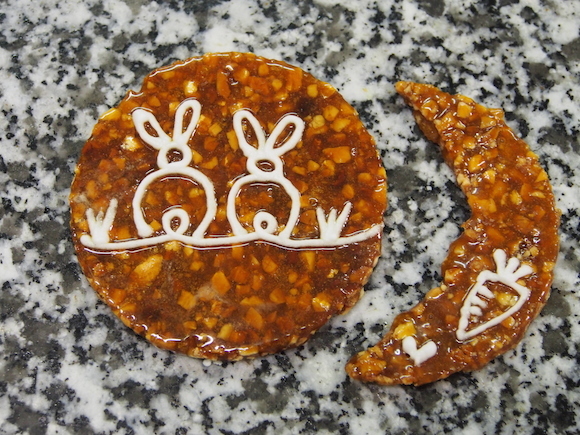 Nougatine needs to be at precisely the right temperature – it must be warm enough to be workable, not so hot that it melts into a puddle and not so cold that it hardens and breaks into brittle pieces. This proved difficult for us beginners. However, we eventually, after some burnt hands, got the hang of it. Then we began assembling the cream puffs onto the base, glueing them one at a time with sugar. This was my first ever attempt at making the croquembouche and I must admit that stacking the cream puffs evenly was way more difficult that I expected. 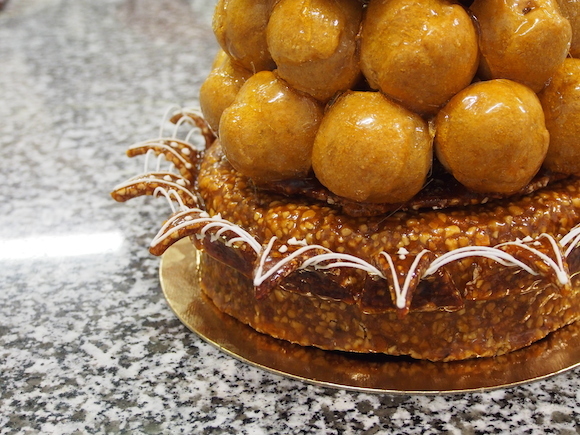 We worked on our croquembouche for three full days in the lab. And in the end, what I had created was a leaning tower of cream puffs. 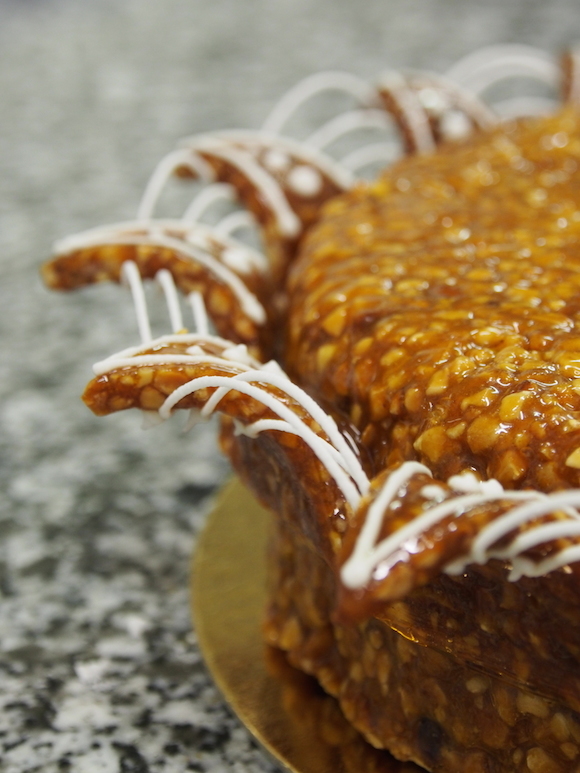 I kept trying to rotate my creation to find its best side only to conclude that it was crooked and wavy from all sides (although that’s probably the perfectionist in me talking… as well as the chef laughing at my final creation). I couldn’t help but giggle too when I looked at it. 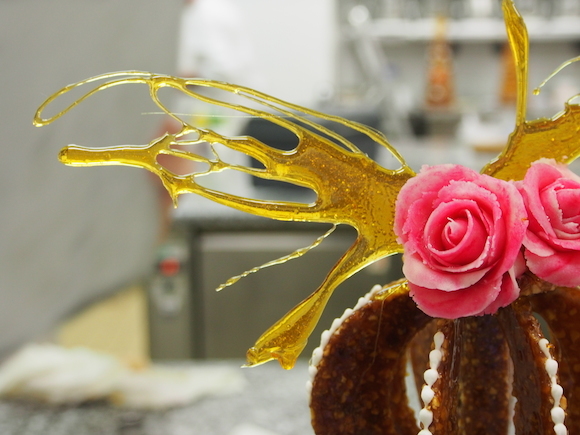 I decided to embrace its “abstract” appearance by topping it off with some curved, crooked sugar pieces and gaudy pink roses – might as well go all out! I used my leftover nougatine pieces to practice piping. I made the bunnies and my partner made them a carrot. 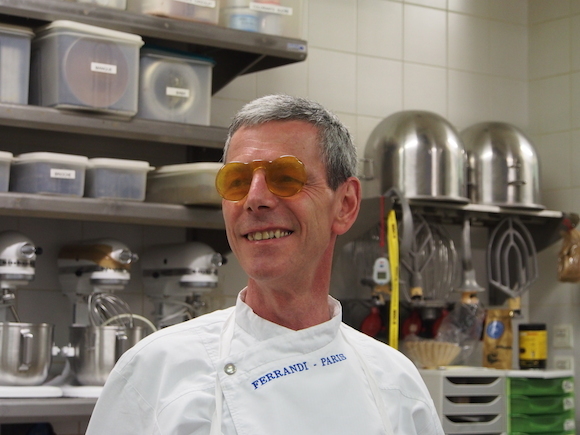 The best part of making the croquembouche, though, was probably when our chef used the leftover sugar to make himself these awesome sugar glasses – never a dull moment with Chef Didier! Hi, do you still live in Edmonton? I’d love to order a dessert from you! Thank you! Hi Alie. So sorry that I missed your comment until now – I just sent you an email with some details.